Food policy councils (FPCs) have been springing up around the country, bringing together various stakeholders such as farmers, food industry representatives, educators, advocates, and health professionals to analyze the food system and work to forge improved food policies. The FLPC created toolkits – one for local-level FPCs and the other for state-level FPCs – that describe some of the major legal and policy issues that FPCs might want to tackle in their own region. The toolkits categorize areas of interest including local vs. state vs. federal authority over food; zoning and land use planning; school food procurement; food safety regulations and inspections; and food access. They lay out the issues and then describe some best practices from around the country. These toolkits are available online and through our clients, the Food Policy Council division of the Community Food Security Coalition and Mark Winne Associates. The food safety rules in Memphis, Tennessee are more restrictive than the rules applied in the rest of the state and in other localities because Shelby County, the county in which Memphis is located, operates under its own local health department. The local health department follows a local food code that was created in 1967 (with very few modifications made in the 1970s and 80s) and applies strict limits to the production or sale of food. The regulations are so restrictive that they cut into efforts to improve access to healthy food by stifling the development of farmers markets and other avenues for healthy food sales. The Memphis and Shelby County Food Policy Working Group, various stakeholders in Memphis, members of the Memphis city government, and even staff of the Shelby County Health Department all agreed that the Memphis Food Code was outdated, confusing, and restrictive. However, since the Handbook was so legal and technical, no one had the time or resources to recommend comprehensive changes to the ordinances. In response to a request from these stakeholders, the FLPC and the Harvard Law School Mississippi Delta Project prepared a comprehensive report analyzing the Memphis Food Code, interviewing stakeholders about barriers to the food system, comparing the Code to other city-level food regulations, and recommending specific revisions to the Code to increase access to healthy food in Memphis and Shelby County. As a result of this report, the Shelby County Health Department has been working with the Memphis City Council to modify and update the Memphis Food Code in order to promote healthy food access and economic development in Memphis and Shelby County. Started in 2012, the Memphis and Shelby County Food Advisory Council is a group of community advocates and government employees interested in using public policy as a vehicle to ensure that all Memphis and Shelby County residents have adequate healthy food available, and to promote the development of sustainable local food in our community. In spring-summer 2014, students prepared a policy brief for the Council analyzing whether the City of Memphis should adopt an ordinance that either requires or encourages corner stores to stock healthy foods. Students conducted policy research and a series of phone interviews with individuals in various cities that have implemented healthy corner store policies to gain a better understanding of how to successfully design and implement this type of policy. The students’ report addresses (i) the benefits and challenges of such ordinances, (ii) best practices for drafting and implementing such an ordinance, and (iii) a model ordinance for Shelby County. The FLPC has a long history of working to strengthen farmers markets in Mississippi, through the work of the Joint Harvard Law School/Mississippi State University Delta Fellow. In spring 2009, at the request of farmers market managers in the Delta region, the Delta Fellow worked with Harvard Law students, to create a Mississippi Farmers Market Legal & Business Guide, which includes topics such as entity structure, sales tax, insurance, food regulations, and other legal and business topics. The students helped draft the guide and conducted a training for farmers market managers from around the Delta. This guide was updated in fall 2011. In fall 2009, the Mississippi Department of Agriculture requested a set of legislative recommendations relating to farmers markets, including how different states treat the taxation of farmers markets, food safety laws affecting farmers markets, and the ability to use food stamps and other federal benefits at farmers markets. Over the past few years, through collaborations between the FLPC and the Mississippi Food Policy Council, the majority of these legislative recommendations have been adopted into law, including eliminating sales tax at farmers markets (2010), allowing county and municipal governments to donate to farmers markets (2012), allowing for the production of cottage foods (2011 regulation), and disseminating wireless EBT machines to farmers markets (2011 regulation). Other clinic work includes a policy and user manual regarding the use of food assistance benefits such as SNAP (Supplemental Nutrition Assistance Program, formerly known as food stamps) and WIC/Seniors Farmers Market Nutrition Programs at farmers markets in Mississippi. 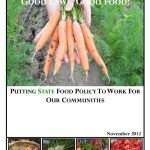 Work with the Mississippi Food Policy Council and other community partners in the state is ongoing. See FLPC’s Current Projects page for more information. The Mississippi Supplemental Nutrition Program for Women, Infants, and Children (WIC program) is the only state program that still utilizes direct distribution of food at food distribution centers. This distribution method may be more cost-effective for the state of Mississippi, but it leads to some negative outcomes for individuals and communities with regard to access, economic development, and nutrition. During the 2011-2012 year, the FLPC prepared recommendations for improving the Mississippi WIC program. Following publication of the report, Mississippi WIC decided to take steps to change its distribution system from direct distribution to retail EBT distribution. During 2012, the FLPC worked with Mississippi WIC to lay out the process of changing the system, including analyzing the steps they will need to take and recommending best practices for some of the legal and policy decisions that need to be made, particularly with regard to vendor criteria and contracts. The FLPC worked in partnership with the Bessie Tartt Wilson Initiative for Children to help analyze and recommend policy changes to the Child and Adult Care Food Program (CACFP) to ensure that as many young children are being served healthy and nutritious food as possible in Massachusetts. The Bessie Tartt Wilson Initiative for Children is a prominent Massachusetts nonprofit that works to strengthen early education and care for children through research, policy development, communication, and advocacy. They are working with Children’s HealthWatch on a broader analysis of food insecurity and the CACFP program, and we assisted with explaining the operation of the program and the general laws and regulations at the federal and state level. Our project focused on describing the legal structure of CACFP at the federal level; explaining how the CACFP program operates in early education centers in Massachusetts; ascertaining barriers to effective operation of the program, including both full coverage for those in need and the nutritional quality of the food provided; identifying best practices from other states; and preparing preliminary recommendations on policy changes to both state and federal law that could help the program to better serve children. Children across the state of Massachusetts, especially those who reside in low-income communities, often lack safe indoor and outdoor spaces that are conducive to engaging in exercise and otherwise maintaining a physically active lifestyle. 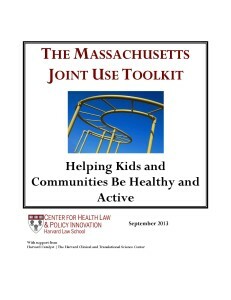 The FLPC worked with the Health Law and Policy Clinic, in partnership with the Massachusetts Department of Public Health and the Harvard School of Public Health, to investigate and facilitate “joint use” of school and other recreation facilities during non-school hours, with the aim of increasing leisure time physical activity and reducing rates of childhood obesity. 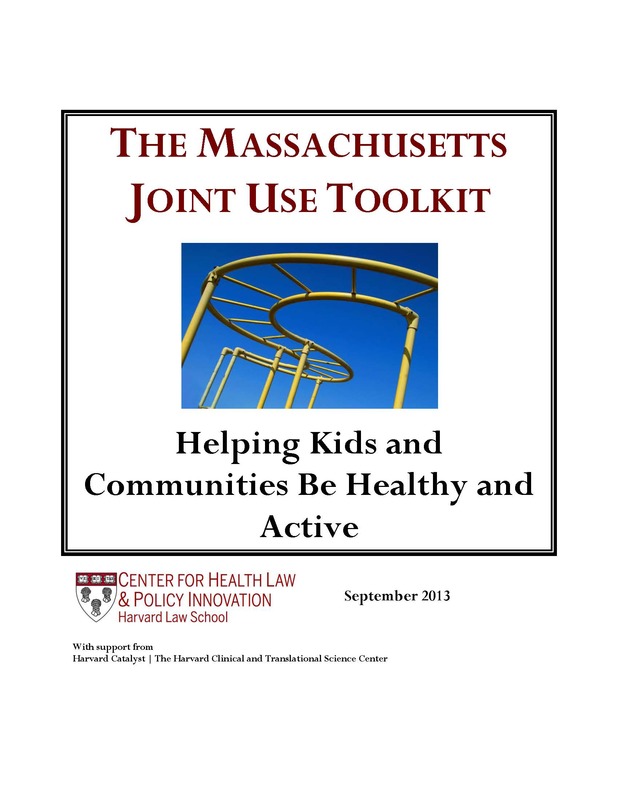 During spring 2013, the Clinic worked with stakeholders in three Massachusetts communities to design and implement effective Joint Use Agreements (“JUAs”) between schools and municipalities. Based on the findings from these local projects, the team then published a joint use toolkit and conducted a training to guide other communities across the state of Massachusetts in replicating best practices as they develop their own joint use initiatives. As a final step of the process, in spring 2014, the team drafted a policy brief discussing policy changes in Massachusetts that can facilitate community use of school and other facilities during non-school hours. The FLPC will continue to evaluate and promote the joint use materials. Proper nutrition is a key component of disease management and treatment. However, patients with illnesses such as HIV and cancer are often so weak that they are unable to maintain proper nutrition independently. Organizations like Community Servings in Boston fill the gap by home-delivering medically-tailored meals to critically ill clients. To Community Servings and its clients, food is as essential to health as drugs or doctors, and so food is medicine. In fall 2012, the FLPC and Health Law and Policy Clinic partnered with Community Servings to develop a report on the funding opportunities for Community Servings and similar organizations through public healthcare and food programs, such as Medicaid and SNAP. The clinics subsequently turned this research into a national report that can assist similar organizations throughout the country. The USDA foods program is a federal program, administered by USDA in conjunction with state distributing agencies, which purchases excess food from farmers and provides it to schools free of charge in order to supplement their food supply for the school lunch program. 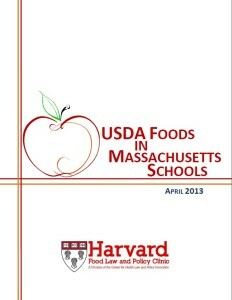 In the 2012/2013 school year, the FLPC prepared a report for Project Bread, a leading anti-hunger organization in Massachusetts focused on ending hunger through developing and scaling impactful solutions to the root causes of hunger, regarding administration of the USDA foods program in Massachusetts. Our comprehensive report analyzed the challenges Massachusetts faces to utilizing the USDA Foods Program and included best practices that Massachusetts and other states could follow to improve program operation as well as the quality of school meals generally. The USDA foods program is of primary concern for two primary reasons: 1) it is responsible for a majority of protein content of school meals (and thus overall meal quality) and 2) the program is a critical financial support for local districts that can free up resources to be invested elsewhere in nutritional improvements. 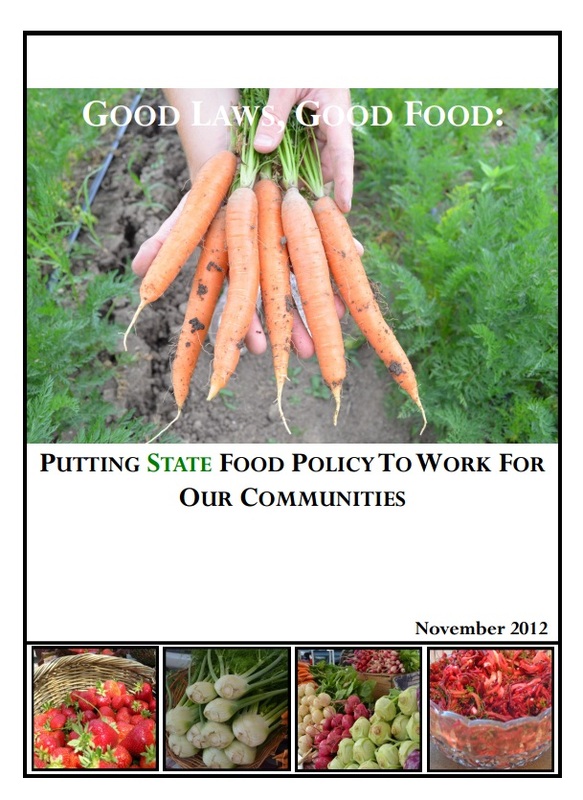 In response to the report, the FLPC met with USDA and was asked to create a more general toolkit that USDA can use to monitor and evaluate state implementation of the program, as well as a shorter handout to help state food service directors in Massachusetts improve their USDA Foods Program. Cottage food laws allow small-scale food producers to produce non-potentially hazardous foods in their homes, allowing for production of these products while avoiding or limiting the need to obtain costly health department permits or licensing. The FLPC has been looking into cottage food laws over the past few years and has advised states about why and how to create cottage food regimes. 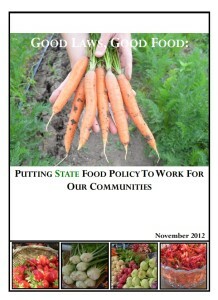 In particular, the FLPC published a report in 2009 encouraging Mississippi to adopt a cottage food law. In response, the Mississippi Department of Health and Mississippi Department of Agriculture and Commerce put out a new policy in spring 2011 that created a new regime allowing for in-home processing in Mississippi. Based on the initial research conducted for the 2009 report, the FLPC published a guide to the cottage food laws in effect around the country. The report provides an overview of the different laws in the states, comparing and contrasting the state laws on five major topics, as well as providing recommendations for best practices. Due to the growth in the number of farmers markets over recent years, many states are now looking to update their food laws and regulations to better promote food safety at farmers markets and other direct-marketing outlets. However, many farmers market managers and vendors complain that these increased regulations impede the development and expansion of markets. Farmers markets offer a great benefit to local communities, as they offer low-cost avenues for economic development and help to get healthy, fresh food out to local communities. After new state food safety laws led to concern among farmers market vendors in Pennsylvania, the FLPC worked to analyze the food safety regulations that pertain to farmers markets in PA and other similar states. Our client, Keep Food Legal, is a membership-based nonprofit organization located in Washington, DC that works with state and local groups around the U.S., including in the state at issue, to forge food laws that make it possible for food producers and consumers to have more opportunities to grow, raise, buy, sell, cook, and eat the foods of their own choosing–including foods available at farmers markets.